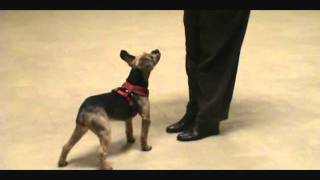 Once you've practiced handling the clicker and treats, you are ready to start working with your dog to teach him a simple behavior - hand targeting. For the following exercises you will need a clicker, training treats, a relatively distraction-free setting to train in and your dog! Training treats should be about pea-size and preferably moist so they can be consumed quickly without interrupting training. Examples of food you can use for food treats include semi-moist dog food, homemade treats, cheese, hotdogs and chicken. Try to reserve the "higher value" treats such as meat and cheese for training more difficult or more important behaviors such as recall (coming when called). Use your dog's regular kibble and subtract from his meal ration if body weight is a concern. A treat bag is optional, but helpful. "Conditioning the clicker" means creating an association (in the dog's mind) between the click-click sound and the food reward. Alone the click-click sound means nothing, but once paired with food it becomes a powerful conditioned reinforcer. Basically what the clicker does is it buys time for reinforcement. To be effective, a reward or "reinforcer" must be delivered at the time a behavior occurs or no more than 1 second later. Using a clicker, we can "mark" the exact behavior we want to reinforce and "bridge" the gap between the behavior and the reward so that the animal knows exactly which behavior is being rewarded. For this exercise you will need 10 training treats. Use a "high value" treat, or something extra tasty for this introduction to the clicker. To "condition the clicker," stand with your dog in front of you and simply click. Follow quickly with treat delivery from your other hand, and remember to avoid moving your treat hand until after you click. There are two options for treat delivery: you can hand the treat to your dog or toss it on the floor. In clicker training, we aim for a "high reinforcement rate," reinforcement rate referring to the number of rewards received over a given time interval. A high reinforcement rate facilitates learning and keeps your dog actively engaged in training. Aim for a rapid succession of 10 clicks, each click followed by a treat. Pause only for your dog to consume the previous treat before clicking again. You only need to practice this exercise once! From here on, your dog will remember what the click means! One of the easiest and most useful behaviors to teach with clicker training is hand targeting (also called "nose targeting"). "Targeting" means touching a body part, such as the nose or paw to an object or place. The object could be a light switch or the palm of your hand. Targeting is a great behavior for all dogs to learn because it can be used to teach other behaviors, and it is also useful to re-focus and calm an anxious or highly aroused dog. To teach your dog to target your hand, you will need a supply of training treats, your clicker and your dog! Place your clicker in one hand with your thumb on the tongue or button and be prepared to click! Hold your target hand, palm forward, an inch or two in front of your dog's nose. At the moment your dog touches your hand with his nose, click! Follow with a food treat. Repeat 9 more times. If your dog wants to touch your hand with his paw, move your hand a little higher and only click when he touches with his nose. If you have a dog that opens his mouth when targeting your hand, try a different target such as a lid from a jar or plastic container. Once your dog is targeting your hand reliably, move your hand an inch or two higher and lower, and a few inches further from his nose. The sight of your palm is the cue for your dog to touch your hand. You can add a verbal cue if desired, once your dog is reliably touching your hand. "Reliable" means that your dog is readily offering the behavior and correctly performing it 8-10 times out of 10 trials or "opportunities." To add a verbal cue such as "touch," say the word just before you click at the moment your dog touches the target. After several sessions of saying your verbal cue as your dog touches your target, say it just before he touches. Continue to click at the moment he touches the target. Finally, eliminate the marker signal and give your cue a little earlier to place your dog's behavior "on cue." Integrate praise as a reward and give food treats only occasionally. These simple steps will get you started with clicker training. You can use these same principles to train virtually any animal to do about anything the animal is physically capable of doing! Once you have learned the basics, you can continue to learn about clicker training by enrolling in a class with a qualified instructor and reading books about clicker training. The Karen Pryor Academy (800-472-5425) is a good place to start to look for a qualified instructor.